Harmonica Blues With A 'Brand' New Beat Memphis harmonica player Brandon Bailey brings a modern take, and an unusual skill, to the instrument. He performs two songs live in the NPR studio. 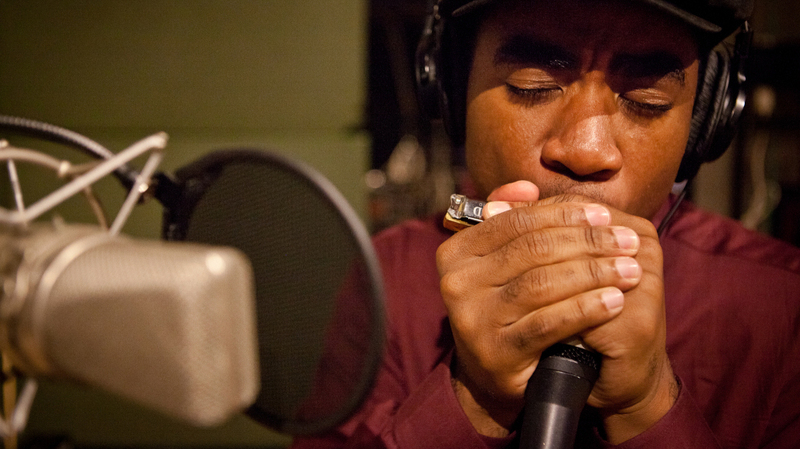 Brandon Bailey demonstrates a distinctive approach to blues harmonica on his album, Memphis Grooves. Hear Brandon Bailey perform two songs live in the NPR studio. The harmonica is a staple of American blues, beginning with the Memphis jug bands of the 1920s. In the 1960s, blues-influenced artists like The Rolling Stones and Eric Clapton brought the harmonica into the sound of mainstream rock and roll. These days, however, few young artists pick it up. Twenty-year-old Brandon Bailey is an exception. His debut album, Memphis Grooves, brings a new take to traditional blues harmonica. As Bailey plays, he uses his mouth as a percussive instrument, a technique called beat-boxing. He also uses a loop pedal to layer and repeat the phrases he creates. Bailey has his own name for his unique playing style: harp-boxing. "I sort of consider it a modernization of the one-man band," he explains. Bailey's interest in the harmonica is rooted in family tradition. His great-grandfather was a harmonica player, who used to serenade the family with train songs — a style that mimics the sound of a speeding train, and was once considered the measure of a player's skill. Hearing his grandmother's stories about his great-grandfather inspired Bailey to take up the harmonica himself. "I got a few books from the library, started watching some instructional videos on the Internet, and that really sparked my interest in the music, especially once I became exposed to the very large history," says Bailey. "Classic players like Sonny Boy Williamson and Big Walter Horton — that tradition of the instrument is extraordinarily important." Bailey uses new technology as a window onto tradition in more ways than one. He says discovered his first harmonica mentor, Ole Miss University professor Adam Gussow, through a series of videos Gussow posted on YouTube. Bailey's new album features a duet with Gussow — a cover of Stevie Wonder's "Superstition." As Bailey develops his innovative harmonica technique, the multi-talented young musician is also completing a pre-med program in pediatric neurology at the University of Memphis. "I don't really know very many harmonica players-slash-doctors," Bailey says. "But I'm far too heavily invested in both fields to give either one up at this point."